Bushmills Irish Whiskey is displayed on both sides of this barrel shaped Christmas ornament. 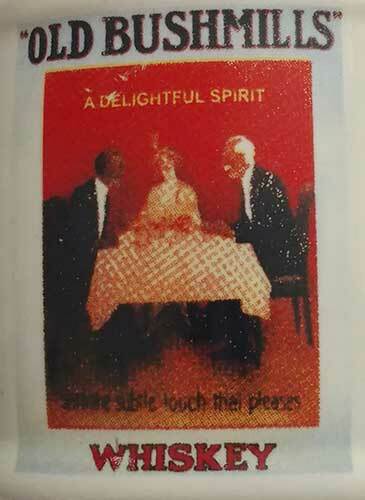 With the subtle touch that pleases. This Irish whiskey ornament features the Old Bushmills brand in the shape of a white porcelain barrel. 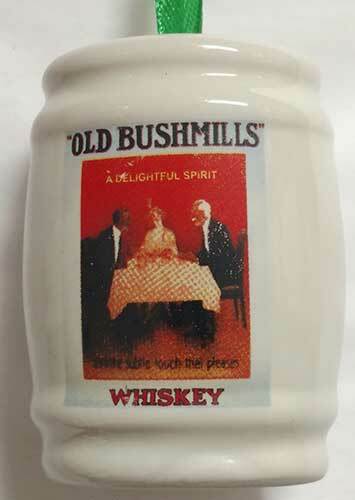 The Bushmills ornament is a dimensional and double sided design that measures 2" wide x 2 3/4" tall x 1 1/2" deep. The Irish whiskey barrel ornament is ready to hang on your Christmas tree with the included green ribbon; it is gift boxed, complements of The Irish Gift House. The Bushmills whiskey ornament is made in Ireland by Liffey Artefacts. Shamrock Whiskey is displayed on both sides of this barrel shaped Irish Christmas ornament. Paddy Irish Whiskey is displayed on both sides of this barrel shaped Christmas ornament. Murphy's Irish stout is displayed on both sides of this barrel shaped Christmas ornament.